Want to sell your products and services here? It's easy! Just upgrade your plan and start adding your products right away. Plus, with a Business or higher plan, you get a complete personal farm website that includes an online store with shopping cart and checkout! These gender nuetral socks will keep your feet warm and toasty in any weather this winter. Alpaca keeps you naturally warm and confortable while the infused Aloe moisturizes your feet and provides restorative healing to your skin. 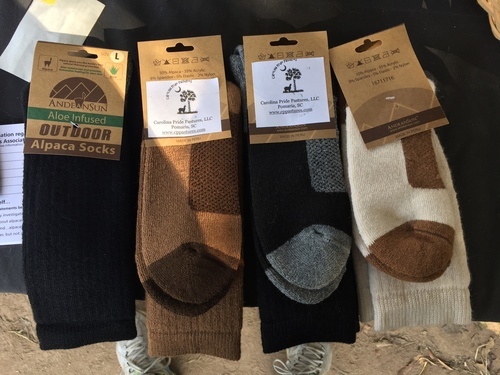 Alpaca socks will stretch and may lose their shape while you are wearing them. A wash in warm water will fix that. Hand washing is best. For regular washing, use cold to warm water and a mild detergent. Lay flat to dry or a very short time in the dryer on the cool setting. Enjoy and stay warm with these great socks!!! The major difference between the large and XL is how far up on the calf the sock goes.